OCC’s map of the road closure and diversion routes. The long awaited resurfacing of Walterbush Road is to start on 2 March. The kerbing and footway will be the first to be resurfaced, starting on 2 March, with the works due to take two weeks. The road will still be open during this time, with traffic lights in operation. On 16 March, the road will then be closed for a week while the carriageway itself is resurfaced. 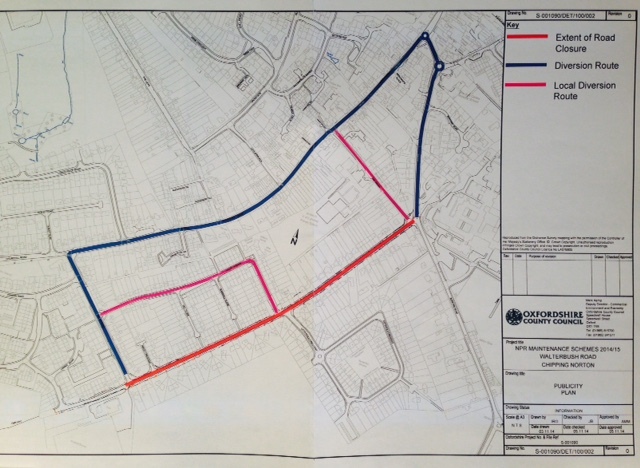 There will be a diversion route in place, taking in Hailey Road, Churchill Road, and Burford Road, which will be signed. There will be no parking allowed on Walterbush Road between 7am and 6pm while the carriageway is being resurfaced. Oxfordshire County Council is warning that although residents’ access will be maintained, there are likely to be “long delays” during the day when work is underway, and is advising residents to park away from the works, so that no obstructions are caused. The work will be carried out in phases, the first between Burford Road and Cotswold Crescent (with access to the latter via Hailey Road) and the second from Hailey Road to Cotswold Crescent (with access to Cotswold Crescent via Burford Road). 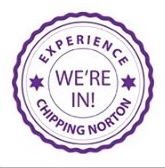 This entry was posted in local services, news and tagged Burford Road, Chipping Norton, Churchill Road, Cotswold Crescent, Hailey Road, Oxfordshire, Oxfordshire County Council, resurfacing, roadworks, Walterbush Road. Bookmark the permalink.